On 4/7, SF Animal Control Officers picked up a stray king pigeon at the intersection of 16th Avenue and Quintara. I wormed him, sprayed him for external parasites and photographed him at the shelter on 4/16. I didn't see any signs of illness but that's because I missed one. Thinking back, I now realize that his seed was so completely scattered around the cage because he was having trouble actually picking up and swallowing it. On 4/19, he was one of seven kings that I picked up from SF ACC in order to prep them for shipping to a Pigeon Talk adopter in Georgia. But this bird was too ill to go. When handled, he shook and trembled and was unsteady on his feet- signs of either neurological injury, salmonella or, most likely, PMV. I pulled him from the group and named him Frances. I'm not positive that Frances is male but his tail feathers have dirty edges and I usually only see that on male pigeons (because they are the ones that do that 'lobster tail strut' thing with their tails fanned downward and dragging on the ground). Frances is starting to get his bird back a little bit. He hated to be handled so I did so as little as possible and that was bad for him. Now I'm feeding him more food more often and he's doing a smidge better. I think he was hungry and uncomfortable and now is starting to cautiously associate me with a full crop and so is not so upset when handled. He'll still wingpop me but it is more controlled and deliberate, less hysterical. After I feed him, I take him to different windows and we watch the world outdoors. He's still not crazy about me but I'm making progress. I'd heard of but never tried throwing seeds down a pigeon's throat until just now. Wow! Poor Frances is just STARVED for the feel of seeds going in. Even with the hand-feeding, he just ate a LOT of seeds as I threw them into his mouth. If he catches one in his beak tip, he clenches, spazzes and throws it across the room in an effort to get it BUT if I get it past the beak tip and actually into his mouth, he swallows like a champ. He showed me beautiful energy and vigor. He wants SEEDS! We've had a BIG breakthrough over here! I think Frances must have been in an actual state of starvation. Friday morning he was doing really poorly and I decided to increase his syringe-fed meals. He got a little bump from that and then, Friday evening, I started with the seeds and he has improved so much. Before the seeds, his scant poop had gone from pale/yeasty to the bright green of organ trouble. His energy was low and his mood depressed. His amoxi course ended Sunday. Since the seeds, Frances' poop is PERFECT & plentiful. His energy is much better and he's feeling so much better. He's still got the PMV challenges (head tremors, poor motor control) but he struts, coos, advertises his nest bowl, stretches, does a lobster-tail hop into his crate and is so much happier. I'm surprised at the difference the change of food has made for him. It's been therapeutic for him. Frances, who had hated being handled, is now totally fine with it. And he thinks I'd make a groovy mate if only I had sense enough to get in his crate with him. He coos with deep bass tones to tell me so. His weight, first thing in the morning and before breakfast, is now 515 grams, up from 415 grams on Friday morning. It's a joy to see him feeling so much better. He can (and does) drink water on his own but finds trying to eat so frustrating and impossible that he'd rather just wait for me to feed him. In over a year and a half of shelter pij rescue, this is the first active case of (most likely) PMV that I've seen. Based on their 'star-gazing' and head movements, I believe that Gurumina and Lu are PMV survivors. Frances (whose name should be spelled Francis if he's a boy, I know, but that I don't like the look of so much, quite to the chagrin of many) is doing very well. He's being a really good sport about putting up with quarantine but he's lonesome! He gets a lot of my time (quite to the chagrin of my many pets) but he can't have it all. I take his crate outdoors so that he can watch and hear the other pigeons but, because of his potentially contagious condition, he can't be near them or, as he'd like to be- with them. As the course of his illness progresses, he should once again be able to feed himself. Even now, he's restarted trying. He had quit fooling with his seed altogether for awhile (I think he was miserably frustrated) but now I find it all scattered around and so know that he's once again trying to eat. In the meantime, I'm happy to do it and he's thrilled. He thinks I'm the best. No more wingpops or beaky roundhouses for me. His happiness and comfort with being fed seems to have generalized to everything. He's no longer fearful or defensive at all. He's a very cute pij and will make some lucky adopter a great pet when he's recovered. Frances continues to do well. He still needs hand-feeding and will get stuck in a twirling episode when out in the wide open spaces (of the backyard or living room) but he's doing well and I have high hopes for his recovery and future. His biggest complaint is being lonesome. He REALLY wants a girlfriend. Watch this video to see him show off what a fit pij man he (thinks he) is. And, for a more detailed explanation of Frances' story, watch this video. And this is Frances returning to his indoor home after spending the day outdoors in the loft with the other (normal) king pij. Frances is special! June 20: SF SPCA Adoption Fair- France's in-bird public debut! Frances has real star quality and he had a great time. I thought he would be tired when we finally got home but he was all jazzed up and pittered and pattered up and down the halls for hours. Mouse over the pictures for captions. Look for Frances' story in Eileen Mitchell's Pet Tales column in the Wednesday, 7/15 SF Chronicle! Frances had an exciting July. Mouse over the pictures for captions. And Frances has a mate! I was THRILLED on Sunday night to find that Frances, who has been SO lonesome and has been trying so hard to get a mate has succeeded. The lucky lady is Country, a hen that was widowed in January when her incredibly sweet mate, Tank, had to be euthanized to end his suffering from cancer. 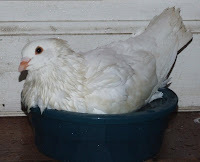 Country is a very serious, no nonsense kind of hen who sat on her and Tank's eggs by herself for over a week around the clock when Tank was at the vet and she didn't know if he'd ever come back. That time he did and she welcomed him warmly. I am so happy for both Country and Frances. Frances has been trying to win a mate for months and, based on how sweet he is with me, I think will be a really loving and generous pigeon husband for Country. People are asking about what this means for Frances' time spent pitter-pattering around the house and our relationship. Over the past few weeks, I've let Frances spend almost all his time outdoors. I LOVED bringing him in and really enjoyed the time that he spent indoors with me but I felt like it made it harder for him to 'be a regular bird' and get a mate. It's like all the other birds got to hang out all night and Frances' had to come indoors with me. 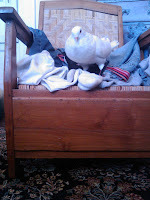 So mostly I had been visiting with him out in the loft but, since he got a mate, I've been leaving him alone. He's so giddy and excited and a little nervous when I'm around and I don't want to give him anything to worry about (like me picking him up and bringing him in the house and another bird getting his girl). Today Country came out of the nest box to get breakfast and Frances was frantic, running back and forth right past her but unable to recognize her in his haste. He was SO relieved when she was back in the nest. Frances is really not in the exact right shape just yet to be a pigeon husband (or God forbid) a father right now. He's still pretty impaired and recovering from the PMV so it's extra nice that Country sees his potential through the handicaps. I am in love with your Frances! I'll keep him in my thoughts and hope for his speedy recovery.